Sea Star Wasting Syndrome is the new buzzword in marine biology these days. But what is it? Sadly, nobody really knows for sure. However, the consequences for large populations of sea stars on the Pacific coast are dire. This problem was first noted in 1983-1984 and 1997-8 in Southern California during periods of warm water- particularly during El Nino. Groups of starfish on California beaches and below the tidal zone began to essentially fall apart, and in many cases die. These incidences lasted from Spring until fall, and were attributed to warm water and perhaps some type of disease. 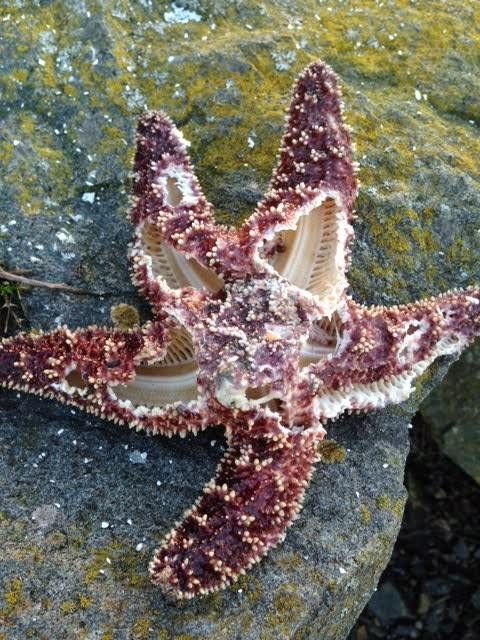 This past year, however, starfish along California, Oregon and Washington began exhibiting the same characteristic symptoms of wasting syndrome, and these effects even lasted through winter months, which has historically not been seen. Scientists at various institutions, including Melissa Miner of UC Santa Cruz, are trying to puzzle out what exactly is happening to these keystone marine predators. Melissa came and spoke at Hatfield Marine Science Center this month, and highlighted some of the major data gaps regarding the disease. 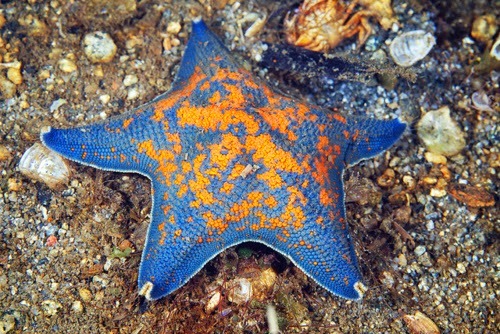 1: Sea stars display a series of symptoms which can be identified as wasting disease. These include the formation of white lesions on the body, followed by general decay, and eventual death in many cases. Stars may lose multiple arms if they do survive. 2: There appears to be a two-step process in sea star wasting syndrome. First, it is assumed that specific environmental 'triggers' start off the disease- unusual circumstances that cause stress to the animal. These might include toxins, pollutants, temperatures, pH or any number of other unknown factors. Then, a secondary infection likely affects the animal opportunistically. 3: The infection or pathogens appear to be spread by direct contact between individuals- bad news for species that often clump together. This is quite the assemblage of species! Many of these animals play very important roles as predators in the intertidal ecosystem. Interestingly, both individuals at or above the high tide line, as well as those below the tidal zone. In fact, animals below the tidal line seem to be affected before those higher up. So what is being done about the disease? Scientists are doing their best to unravel this mystery. 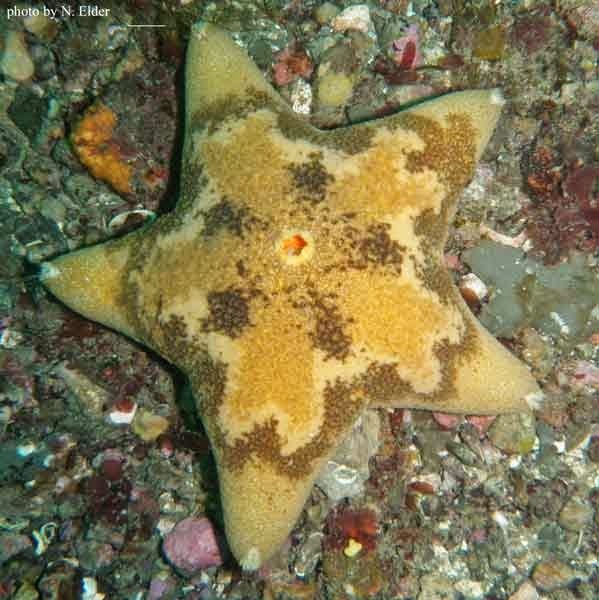 Sea stars have been tested for radiation, and no abnormal levels have been found. Therefore, it is unlikely that radiation from Fukishima has much to do with the syndrome. Where is this disease being found? 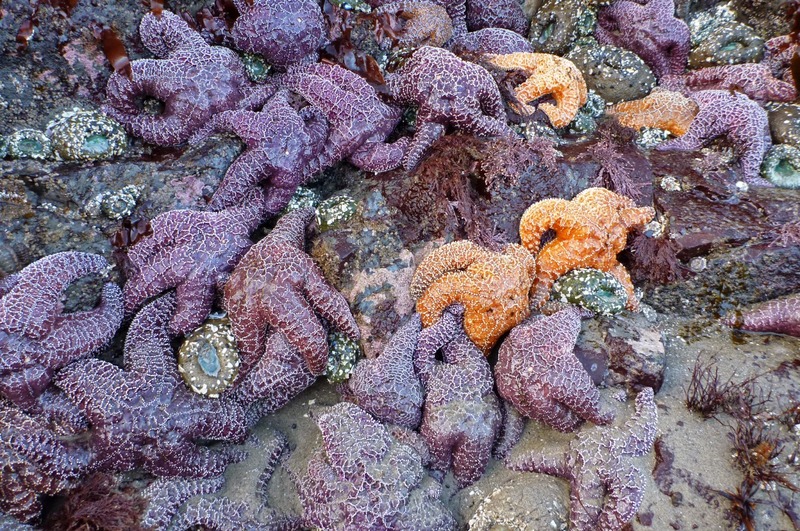 Sea Star Wasting Syndrome has been found in 59 of 99 (60%) of study sites along California, Oregon, Washington, and BC. These include Vancouver BC, Seattle, Monterey Bay and Santa Barbara. How can I help scientists study wasting syndrome? 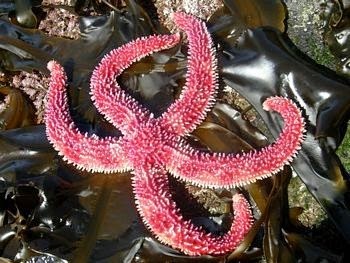 There is now a website where you can report sea stars that appear to be affected by the disease, as well as learn more about wasting syndrome. Please visit http://www.eeb.ucsc.edu/pacificrockyintertidal/data-products/sea-star-wasting/ to learn much more and report your sightings! Let's help out our intertidal friends. Sea star aggregations such as this might increase spread of disease.